Blood libel: part of the ad as it ran in US papers (click here for full image). Despite an outcry from its own readers, The Guardian went ahead and published this disgusting ad in today’s print edition. This despite an online petition against the ad, which the Stop the War Coalition says was signed by 140,000 people within 24 hours. Any newspaper that published an advertisement accusing Jews of “child sacrifice” would rightly be condemned as anti-Semitic. How is it, then, that Britain’s leading “liberal” newspaper is set to publish just such an ad about Palestinians on Monday? Newspapers can pick and choose the ads they run, and often turn down offensive submissions. As The Guardian notes, right-wing London newspaper The Times has, to its credit, rejected the ad. The ad was composed by US TV personality Rabbi Shmuley Boteach and Nobel prize-winning author Elie Wiesel. Wiesel has been a chair of the advisory board of Elad, a group of fanatical religious Israeli setters actively involved in ethnic cleansing of Palestinians from the eastern sector of occupied Jerusalem. The ad, already run in some US newspapers, is incitement to genocide. Its dog whistle reference about “child sacrifice” will be clearly understood by religious fundamentalists. Despite Israeli propaganda refrains about Palestinian resistance fighters supposedly using the population of Gaza as “human shields,” zero evidence has been presented. This is a calumny, and a blood libel against the Palestinian people – one readily accepted by too many journalists. I saw no evidence during my week in Gaza of Israel’s accusation that Hamas uses Palestinians as human shields. I saw men from Hamas on street corners, keeping an eye on what was happening. They were local people and everyone knew them, even the young boys. Raji Sourani, the director of the Palestinian Centre for Human Rights in Gaza, told me that Hamas, whatever you think of it, is part of the Palestinian DNA. Like so many Zionist propaganda accusations against the Palestinian people, the “human shields” calumny is a projection. It is Israel that has a long record, documented by local and international human rights groups, of using Palestinians as human shields. A new piece by journalist Max Blumenthal this week documents how Israel even uses its own civilians as human shields. Circulated by the International Jewish Anti-Zionist Network yesterday, organizers are hoping to be able to raise enough money to run the statement as an ad in The New York Times, which published the Elie Wiesel ad. “Child Sacrifice: We’re Not So Different Today” — screenshot from a modern evangelical website. The dog whistle in the ad will be clear to anti-Palestinian religious fundamentalists from the language used. The reference to alleged “Canaanite practices of child sacrifice to Moloch” is explicit. In the Hebrew Bible, known to Christians as the Old Testament, the Canaanites were people who lived in the land before the mythical figure Joshua drove them out. The Bible depicts this as a bloody genocide. The implication of all this is clear: the Canaanites deserved to die, because they killed their own children. This racist ad makes an explicit parallel between these ancient myths and modern-day Palestine, casting the Palestinian people as the modern-day Canaanites. The implication of this disgusting ad is that the Palestinians, too, deserve to die during Israel’s ongoing brutal assault in the Gaza Strip. 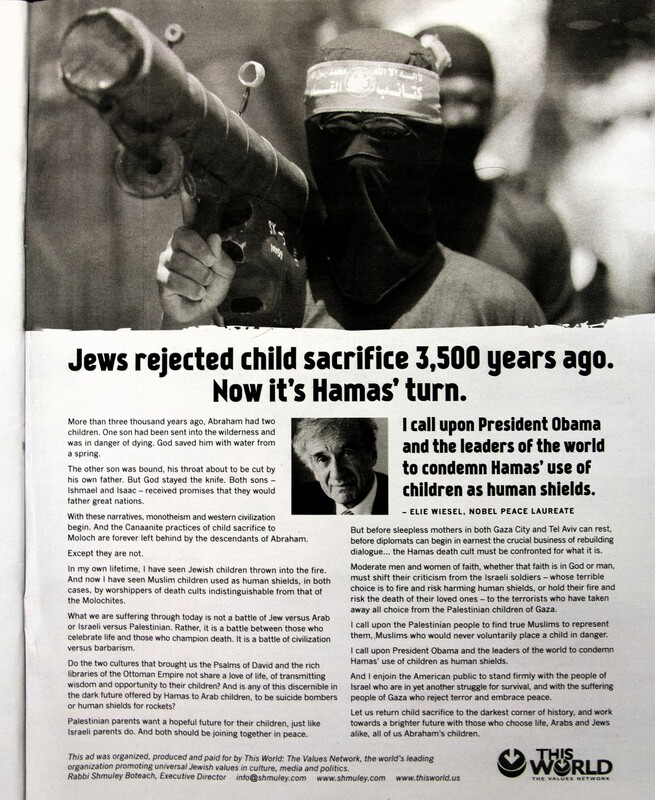 While the ad is ostensibly addressed to “Hamas,” the implication is clear: the hundreds of Palestinian children that Israel has killed were actually “sacrificed” by Hamas. Israel must have been forced to kill them. In the context of ever-increasingly explicit cries in Israeli society for complete genocide in the Gaza Strip, such incitement must be taken most seriously. Israeli army officers have recently called for “holy war” against Gaza by “God’s army” – supposedly the Israeli army. That The Guardian, a supposedly liberal newspaper, seems to want to add fuel to these deadly flames by publishing such a disgusting ad speaks volumes about its anti-Palestinian agenda. Do they need the money that badly ? I swear by the Guardian Weekly, and I swear that I will NEVER buy it again if this ad is published. I can't believe it. Unbelievable - quite simply unbelievable. How could any newspaper, particularly one that holds itself up as having some liberal values even consider publishing such racist garbage? I don't know why anyone expects progressive views from The Guardian. It was only ever a Liberal newspaper, which sided with Liberal Imperialists and the small and medium-sized business sector. It has never supported the truly progressive forces in UK society. It is simply the least worst of the mass circulation papers, I suppose. I still would not read it on any regular basis. If they do accept the ad, perhaps this act will rip the scales way from the eyes of their regular readership and start a reaction which might - just might - lead to the production of a truly decent progressive mass circulation newspaper in the UK. It is long, long, long over-due. So based on the above ad the jews came into existence 3,000 plus years ago. They left the land of israel 2,000 years ago, only to return in the 20th century. That means the palestinians have been there roughly longer- 2,000 years vs. 1,000 plus years for the jews. All this while i thought the jews had been there since forever but it looks like they had not. They are that bend over to print such ad? author appears not to know what "blood libel" means; it is a specific anti-Semitic trope about Jews kidnapping Christians and draining their blood for ritual sacrifice. Using it carelessly to mean "encouraging child-killing" trivializes historical anti-Semitism. It's also lazy writing and actually worsens the author's argument, since genocide is already in there and is a far worse charge anyway. I suspect that the author understands the specificity of the term "Blood Libel" and employs it to make a valid rhetorical point. The myth that Hamas uses human shields is used to justify wanton and reckless brutality in the same manner as the myth perpetuated in the form of the Blood Libel. It's not a great comparison, but it's not the worst I've seen. In any case, invoking the Blood Libel to point out the baseless propaganda employed by Israel's partisans does less to trivialize historical (and ongoing) antisemitism than the cynical exploitation of the phenomenon habitually made by the above mentioned partisans. In their efforts to immunize Israel from criticism and consequence they've managed to turn the accusation of antisemitism from a potential career-ender into a veritable badge of honour. I also noticed this and agree with your analysis. Hey Mr. Mockery of the Nobel Peace Prize, you are more of a Goliath than an Abraham. So Elie Wiesel tells us that he "has seen Muslin children used as human shields." Perhaps Mr. Wiesel can tell us if he personally witnessed this on his travels in Gaza, or maybe when he was in the West Bank. Is Mr. Wiesel really stupid enough to believe that this is so because Israel says it is so. Or maybe he is confusing it with the fact that it is the Israeli soldiers that have used Palestinian children as human shields, as has been verified by many independent observers. elie wiesel who? the notorious imposter and manipulator of holocaust thing? The Guardian's action is another reason why the ongoing death of print media is a good thing. Since I like to think that average citizens in the UK are more enlightened on Middle East issues than those here in the US (even if their leaders and institutions often aren't), I hope the Guardian's decision will lead to a large number of people cancelling their subscriptions to the paper. The Guardian removed your comment? They've been doing that to plenty of people, particularly those who comment on editorial policy and censorship. One of the gatekeepers ("moderators" in Guardian parlance) at Comment is Free is the senior editor's daughter. The whole exercise is fraught with undisclosed conflicts of interest and corporate concerns which mustn't be exposed or challenged. The recent hard turn to the Israeli position in the massacre of Gaza is merely the latest indication of something very dishonest at the heart of the operation. Did you actually read the ad? Did you actually read the ad? It calls for peace between Jews and Palestinians. How is that a call for genocide? Please explain. Because it is trying to shift the blame of killing children from the actual killer the Israeli govt to Hama's. The ad is trying to divert attention from real culprit the israeli govt.to Hama's which is only asking for a right to live normal life. The ad is trying to cover up the Israeli govt crime and therefore is helping genocide. Genocidal mindset + constant projection + constant distortion and outright lies + willingness to sacrifice one's own (Hannibal directive): it wouldn't surprise me if Israel carried out a bloodbath amongst Jewish kids, blamed it on Hamas, and used this as the excuse to deal with Gaza once and for all. Oh yes, and Elie Wiesel is a disgrace to the Nobel Peace Prize, but we've known that for decades. I indeed hope The Guardian will not run this inflammatory (and utterly idiotic) ad. I shall be surprised and disappointed if the Guardian prints this ad but in any event it's foolish to suggest the Guardian has an anti Palestinian agenda, because it clearly does not. If you doubt my words, read the paper and check for yourself. Is there is no limit to the lies the Zionist resort to to justify slaughtering of innocence? Is there no limit to the space and air time given to publicise this filthy propaganda in the Western media? Is there no limit to the double standards of the Western governments? The propaganda is so preposterous, that the general public now sees it for what it is. That Elie Wiesel should put his name to this sly and nauseating piece of hasbara is not surprising; his crocodile tears for Palestinian children and his defence of their murderers are typical of the man. That the Guardian should consent to publish this dangerous provocative racist rubbish is both deeply disappointing and alarming. I cant believe that you have agreed to publish what even the Times refused to do. This is the last you will ever hear from me and I will never again come to one of your Masterclasses. I will also regularly Tweet adverse comments to encourage readers to boycott the Guardian. Your paper, along with the Observer and Guardian Weekly are the only papers i buy. NEVER AGAIN. Are you so desperate for money? The ad, besides being grossly offensive, is false. See the story of Jephthah in Judges, circa 1075 BCE. He sacrifices his virgin daughter as a burnt offering for a military victory.. if Zionists want to post propaganda, they should at least know their own scriptures. I cannot support the Guardian in this - please do not print this racist, inflamatory and untrue advertisement. Every time you think you cannot take any more of this idiocy and support of terror, there comes another peice of news to knock you over backwards. Shame on the Guardian for even considering this ad. I hope by tonight they will have wisely rethought. Is this the sick payback for all the Jews calling for true Judaism to represent them instead of Zionism? Please do not run this completely untrue ad by a man who has abandoned all his ethical and moral standing with the rest of humanity..The lies he is trying to spread in this ad are Israeli propaganda to justify their war crimes of murder of Palestinian children in Gaza. There is no proof of this outrageous claim! Indeed Israel itself is guilty of this tactic and has been filmed using Palestinian children as human shields in the West Bank many many times, a outright war crime! If you run this ad you will be complicit in these lies, a player in the dehumanization of the Palestinian people by mendacious apologists for the slow genocide of the indigenous people of Palestina by Israel and its illegal settlers. Why is it that the Palestinian/pro-peace side is not taking ads in major papers? 2 ads have already been published in the Boston Globe... Why is it that 3 or 4 organizations can't do the same? The Guardian newspaper has a troubled relationship with the Palestinian struggle. On the one hand, a few outstanding columnists such as Seaumas Milne defend the rights of the Palestinians. On the other, the editors are known for their partiality to the Israeli narrative. Censorship at the paper's online feature Comment is Free is a notorious feature. Contributors are frequently banned, always without explanation, and comments which violate undefined "Community standards" are expunged. Among the subjects prohibited from mention in the current massacre have been the Warsaw Ghetto Uprising (for the obvious resemblances to today's situation) and Israeli Jewish figures such as Yeshayahu Leibowitz, whose opinions were at variance with the policy of occupation. For the Guardian now to publish an advertisement so openly racist and genocidal marks a new low in the paper's history. Readers look in vain to the editors for a principled opposition to war crimes and ethnic cleansing. Reporters' copy is routinely altered to reflect Israel's claims, and the paper's best correspondent in the field, Peter Beaumont, appears to have been suspended or sacked for his wrenching and truthful dispatches from Gaza. Acceptance of this disgusting piece of propaganda by the Guardian does not mean that readers will follow suit. We must express our indignation to Alan Rushbridger and his colleagues at the top. The paper is badly in need of a cleanup. I can verify Tom Hall's remarks concerning the Guardian's comment is free section. My very brief comment on fashion writer Hadley Freeman's nonsensical and contradictory article (published in Saturday's edition) was expunged without explanation for breaching "community guidelines". All I said was that she should get back to fashion because she was out of her depth. I don't see that as being offensive, merely apposite. The Guardian has really lost its way. I can also confirm that contributors are regularly banned by CIF. I contributed a no. of posts around 2007 concerning primarily Zionist misuse of 'anti-Semitism' (& a real anti-Semite Gilad Atzmon) and my final article was on a Royal invitation to the JNF to Windsor Castle on Israel's 60th year of massacres and murders. Zionist organisations like CIF Watch lobbied to have me banned as too radical and bicycling correspondent, Matt Seaton, who doubled up as CIF's editor, obliged. CIF today is anything but free. I can't believe that an English newspaper could contemplate publishing such an egregious lie doesn't it warrant a complaint to the Press Complaints Council or whatever it calls itself now. Obviously a Nobel prize doesn't make you a good person. It is disingenuous of the Guardian to say it doesn't have to agree with what it publishes -what sanctimonious hypocrisy. I have had serious doubts of late as to where the Guardian's loyalties are but I have persisted in buying it - no more! This is just incredible. Murder children every day, execute unarmed children, bomb hospitals, schools and then blame the Palestinians? I will NEVER buy it again if this pro-genocide ad is published.This is unforgiveable. Until now I have always had a great deal of respect for your paper. But hearing you want to print the pro- genocide ad seems totally out of character. Really, why would you want to print such rubbish? and and why would you want to print something that only ads fuel to the fire and isn't even news? So the public is to believe that the Palestinian population willing allows Hamas to use their children as human shields? That concept goes completely against nature. There would be riots in Gaza if parents were having their children forcibly taken away. I can think of no mammal that would sacrifice it's offspring willingly. What, Palestinians are genetically different from all other human beings? Are the Nazi spirits mind melding with these Jews running the ad? I believe the Nazi's made similar charges against the Jews during WW2. Elie Weisel is a Nobel prize winner, why would he debase his name with such a racist and bigoted charge? The Guardian is a respected paper, why would they debase their name? Pathetic. Does the Palestinian cause really need censorship to succeed? Definitely not. The Elie Wiesel logic will destroy itself. Portraying Hamas as child killers will prove to be a desperate last resort before the whole house of cards will come tumbling down. Look at the Max Blumenthal video's. He lets everyone speak. Why? Because what they're saying makes no sense. Just like Elie Wiesel's ad. Freedom of speech is a good thing. "Freedom of speech is a good thing." Agreed; so why don't the Palestinians have it, whenever they attempt (by peaceful protest) to tell the world there is no freedom in Occupation of another peoples land? As someone who has bought The Guardian for 44 years, I can confirm that I bought my last on Saturday, 9 August, 2014. Talks cheap (and it don't come much cheaper than this piece of garbage) but action is louder than words; so take it. Make the Guardian accountable. Withdraw this ad or answer to ' Press Complaints Commission' (link below) and a barrage of complaints from people like us. And by the way; it's not only 'israeli produce' subject to 'sanctions'. The Guardian needs us more than we need them. This vile piece of lies and vicious propaganda is the most outrageous heap of evil spite-filled incorrect text we have seen. Very angry if this gets published. Never will we buy your paper again. Elie Wiesel and Rabbi Boteach show themselves to be shameless racial supremacists. Their "advert" deliberately ignores that in the biblical account rejecting child sacrifice "3,500 years ago", God was instructing Abraham, the ancestor BOTH of the Jews (with his first wife Sarah, bearing Isaac) AND the Muslims (with his second wife Haggar, bearing Ishmael). The rejection of child sacrifice is therefore a SHARED tradition of Jews and Muslims according to the holy Torah itself. Wiesel and Boteach's blood libel against Hamas, made without any evidence, is immoral, but also incredibly foolish and dangerous. We Jews have been victimised by similar false accusations, and now Wiesel and Boteach make the world a more dangerous place for us by legitimising this dirty weapon. False Rabbi, go learn the 7th Commandment: "Thou Shalt Not Covet Thy Neighbour's Land. Go learn Bava Basra (Jewish land law) which holds that the owner of land is the person stated in the title deeds (not to be stolen from him, or from his heirs, by the cynical "Absentee" law of the zionists). And if the title deeds cannot be found, the owner is the person who has cultivated the land for three successive seasons (not the armed colonist who drives off the farmer and claims that God desires him to grab it today by force, blasphemously casting the Almighty Creator as a mere accomplice of thieves and thugs). From this it is clear that the Zionist policies promoted by Wiesel and Boteach are in fact hostile to Jewish thought, and damaging to the reputation of Jews and Judaism. They should be rejected by all authentic Jews. I am a Harm Reduction worker and read the Guardian regularly because of their truthful coverage. I realize that you depend on advertizing in order to survive, but you also have a choice to run ads that comply with your ethical reputation. If you choose to go ahead with your plan to run this morally objectionable ad, I and many others like me will lose the respect that you have gained over the years. I am ashamed and feel disbelief that a purportedly liberal newspaper, the Guardian, has decided to publish such a despicable advertisement. It is a travesty of all that is decent and everything I thought the paper stood for. I have read the Guardian for many decades. I will not be reading it again. I'm dismayed the Guardian would run such an advert. I know they're financially in trouble, but even still. As a daily purchaser of the Gruniad and Observer, I've decided to stop buying it and use Adblock on their website. I'm not willing to give any money to this company any more. I hope others do the same. There is a body that deals with false, misleading or offensive advertisements - the ASA. Perhaps complaints to them would yield fruit? "The ad, besides being grossly offensive, is false. See the story of Jephthah in Judges, circa 1075 BCE. He sacrifices his virgin daughter as a burnt offering for a military victory.. if Zionists want to post propaganda, they should at least know their own scriptures." You'll need to search it out, though, and give chapter and verse. Then you can add the evidence for Israel using Palestinians as human shields - it's out there on the internet. and refute anything else claimed in the advert. You could also ask for the Guardian to be forced to print a retraction and/or apology - using the same amount of space as the original advert. What on earth made you accept such a terrible and controversial advert. There is NO proof whatsoever that Hamas is using anyone as human shields..The only thing that is to blame for the deaths of so many women and children in Gaza are the shells and bombs that are sent by Israeli Forces into a hugely populated area. And not just normal weaponry, but internationally BANNED armaments, that cause immense injuries to civilians. I hope that you are ashamed of yourselves and your editorial staff for allowing such Propaganda.